Do you need concrete retaining walls or rock retaining walls in Crowley and Fort Worth, TX or the surrounding areas? You’re in luck! Here at Ware Fencing, we provide a variety of fencing and stonework throughout the city, and we craft durable and affordable retaining walls. For years, our experts have worked alongside clients in residential, commercial, and even farm and ranch properties to craft reliable retaining wall solutions, and we have the experience you want for your next project. Give us a call today at 817-948-4503 to speak with one of our friendly associates about how we can serve you today! 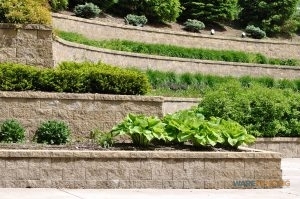 Retaining walls act as a functional and pleasant addition to your property’s landscaping. However, like most landscape additions, you have plenty of different options if you want to install one. The most popular choices are concrete retaining walls and rock retaining walls, for both style and durability. When installing a concrete retaining wall, you have the benefits of lower cost and better coverage. Because the concrete blocks used to create this type of retaining wall are specifically made to interlock with one another, they are perfect for taller or larger retaining walls, and they tend to provide more reliable coverage later on down the line. 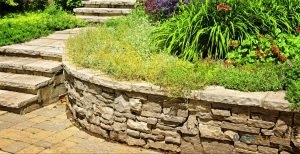 Rock retaining walls, on the other hand, are often preferred for their traditional appearance. People have been using natural rock for retaining walls for centuries, and they are quite beautiful to behold. However, natural stone is a more expensive material and will require a bit more creativity in assembly. Because the stones cannot fit together perfectly, moisture may be able to slip between them and cause deterioration over time. Also, this method is only suitable for shorter retaining walls, since the stability is compromised if the rocks are stacked too high. If you are interested in learning more about our professionally installed rock retaining walls in Crowley and Fort Worth, TX and the surrounding areas, give us a call today at 817-948-4503! Our experts are happy to answer any questions you may have and to help you choose the ideal retaining wall installation for your budget and your needs. Updated on September 20, 2018 at 9:08 am by Ware Fencing.